Arizona US State Arizona, a southwestern U.S. state, is best known for its reliably sunny weather and as home to the Grand Canyon, the mile-deep chasm carved by the Colorado River. Many visitors utilize Flagstaff, a Ponderosa Pine covered mountain town, as a gateway to the Grand Canyon. 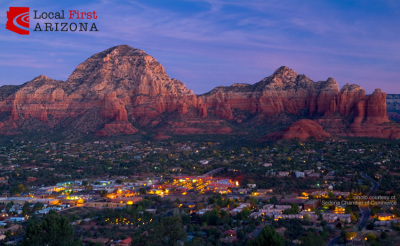 Other natural features include the Saguaro cactus-filled Sonoran Desert and the rugged formations of Red Rock State Park. Capital: Phoenix Minimum wage: 8.05 USD per hour (Jan 1, 2015) Population: 6.731 million (2014) State Bird: Cactus Wren Arizona (Navajo: Hoozdo Hahoodzo; O'odham: Alĭ ṣonak) is a state in the southwestern region of the United States. It is also part of the Western United States and the Mountain West states. It is the sixth largest and the 14th most populous of the 50 states. 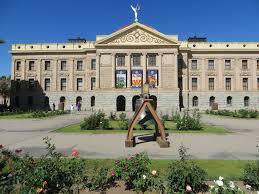 Its capital and largest city are Phoenix. Arizona is one of the Four Corners states. It has borders with New Mexico, Utah, Nevada, California, and Mexico, and one point in common with the southwestern corner of Colorado. Arizona's border with Mexico is 389 miles (626 km) long, on the northern border of the Mexican states of Sonora and Baja California. 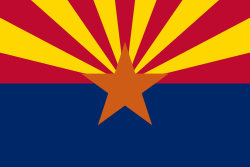 Arizona is the 48th state and last of the contiguous states to be admitted to the Union, achieving statehood on February 14, 1912. It was previously part of the territory of Alta California in New Spain before being passed down to independent Mexico and later ceded to the United States after the Mexican–American War. The southernmost portion of the state was acquired in 1853 through the Gadsden Purchase. 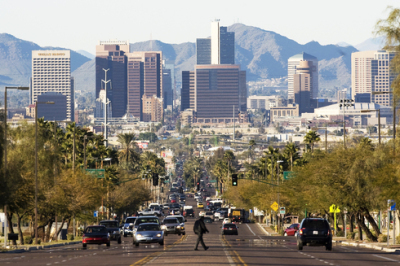 Southern Arizona is known for its desert climate, with very hot summers and mild winters. Northern Arizona features forests of pine, Douglas fir, and spruce trees; the Colorado Plateau; some mountain ranges (such as the San Francisco Mountains); as well as large, deep canyons, with much more moderate summer temperatures and significant winter snowfalls. There are ski resorts in the areas of Flagstaff, Alpine, and Tucson. In addition to the Grand Canyon National Park, there are several national forests, national parks, and national monuments. About one-quarter of the state is made up of Indian reservations that serve as the home of some Native American tribes. 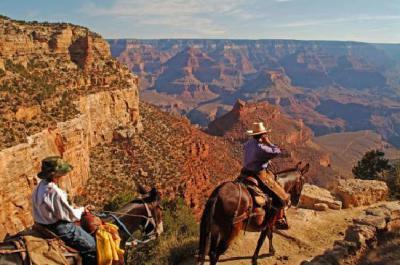 History Main article: History of Arizona The North Rim of the Grand Canyon. Before the modern era, Arizona was home to numerous Native American Tribes. Hohokam, Mogollon and Ancestral Puebloan cultures were among the many that flourished throughout the entire state before the arrival of Marcos de Niza, a Spanish Franciscan, in 1539. He explored parts of the state and made contact with native inhabitants, probably the Sobaipuri. The expedition of Spanish explorer Coronado entered the area in 1540–1542 during its search for Cíbola. Father Kino was the next European in the region. A member of the Society of Jesus, he led the development of a chain of missions and converted many of the Indians to Christianity in the Pimería Alta (now southern Arizona and northern Sonora) in the 1690s and early 18th century. Spain founded presidios ("fortified towns") at Tubac in 1752 and Tucson in 1775. When Mexico achieved its independence from Spain in 1821, what is now Arizona became part of the Territory of Nueva California, also known as Alta California Mexico in 1824. Alta California is the northwestern-most state. In the Mexican–American War (1847), the US occupied Mexico City and pursued its claim to much of northern Mexico, including what later became Arizona. The Treaty of Guadalupe Hidalgo (1848) specified that in addition to language and cultural rights of the existing inhabitants being considered as inviolable, the sum of US$15 million in compensation (equivalent to about $410 million in 2012 be paid to the Republic of Mexico. In 1853, the land below the Gila River was acquired from Mexico in the Gadsden Purchase. Arizona was administered as part of the Territory of New Mexico until southern New Mexico Territory seceded from the Union as the Confederate Territory of Arizona on March 16, 1861. Geronimo and his Apache warriors raided and fought against both Mexicans and American settlers Arizona was recognized as a Confederate Territory by presidential proclamation of Jefferson Davis on February 14, 1862. This is the first official use of the name. Arizona supported the Confederate cause with men, horses, and supplies. Formed in 1862, Arizona Scout Companies fought with the Confederate Army throughout the war. Arizona has the farthest recorded Western engagement of the war, the Battle of Picacho Pass. A new Arizona Territory consisting of the western half of New Mexico Territory was declared in Washington, D.C., on February 24, 1863. The new boundaries would later form the basis of the state.